Bulk SMS Malaysia | Monthly Summary - lowest price & most reliable Bulk SMS marketing tool, 2 way sms Malaysia, works with Bulk SMS Singapore, online sms solution, web sms marketing. 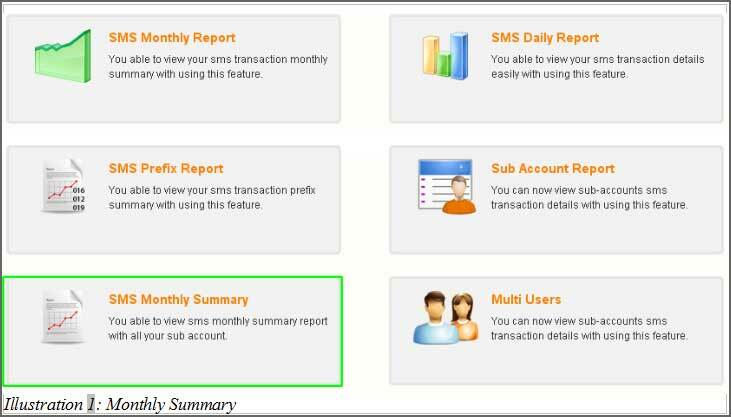 A bulk SMS monthly summary is as equally important as the daily sms report because the monthly summary holds information for the total usage in your main SMS account. This is useful when your company is doing budget planning and decides if its necessary for you to add more budget to focus on SMS marketing. 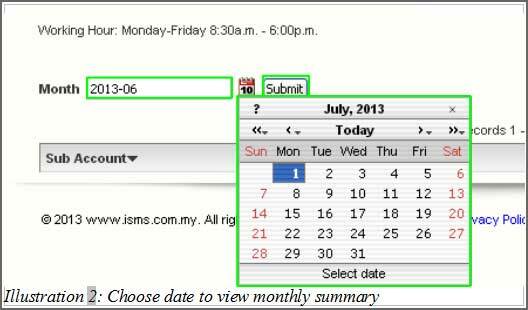 You will be able to view their monthly summary by clicking on "SMS Monthly Summary". After clicking on it, user will able to view as picture shown below. You can choose the date to show the monthly summary, or write out the month to show the monthly summary. Lastly, click on the "Submit" button beside the calendar button. After clicking on the "Submit" button the record will show up on the table as below.